Screw Chiller – TEMPEST, Inc.
Screw chillers are effective cooling solutions for industrial processes as well as making for efficient air conditioning systems for large facilities like office buildings, schools, theaters, factories, warehouses, shopping malls, libraries, etc. In these applications chillers use less power than traditional air conditioning methods. Like all chiller systems, screw chillers are composed of an evaporator, expansion valve, refrigerant, internal piping and controls. Their compressors are the main point of difference for screw chillers, using two helical rotors that propel and compress the refrigerant gas. 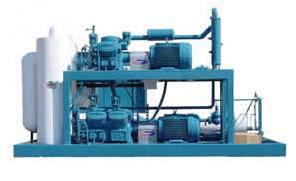 This type of chiller has nearly constant flow performance, and is powered by an electric motor, steam or gas turbines. Their capacity range is anywhere from 25 to 800 tons, and they are effective when used with liquid that has higher evaporating temperatures. The screw, or helical compressor in screw chillers consists of two mating helical grooved rotors-the male lobes and the female gullies. They are housed in a stationary casing and move simultaneously. As they rotate, the refrigerant gas is compressed by direct volume reduction between the two rotors, and transformed into vapor. These compressors are equipped with a slide vane that adjusts the length of the compression path. The suction, compression and discharge all occur in one linear direction. An oil lubricant on the rotors acts additionally as a sealant. The motor cooling happens when refrigerant flows through holes in the screw, and the screw operates as a liquid separator. It is important for screw chillers to be appropriately sized. When they are too big, they have long anti-recycle times and will shut down if there is no demand for cooling. This will also happen if the motors are running at high, unnecessary speeds or they are open drive. When configured properly, however, screw chillers can be reliable and efficient liquid chillers for a whole host of industrial and air conditioning applications. Screw Chiller A screw chiller is a liquid chiller that uses two rotating helical screws to provide the needed pressure to drive the vapor-compression refrigeration process. Screw chillers are more compact, quieter and contain fewer parts than their alternatives: reciprocating, centrifugal and absorption chillers. 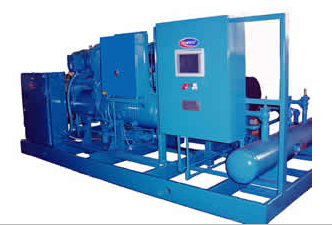 Screw chillers rarely break down, have long life spans and require little maintenance.